Fast food is a way of life for many Americans. 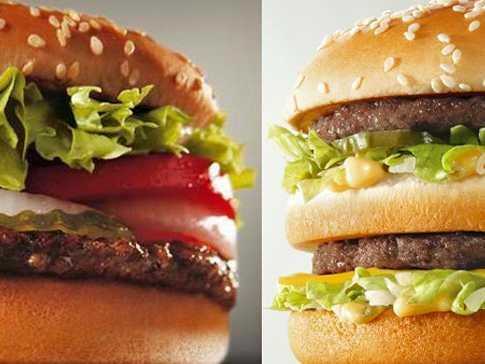 But new findings suggest that people may be starting to cut back on the french fries, Big Macs and Whoppers ®. According to new data compiled by the National Health and Nutrition Examination Survey (NHANES), from 2007 to 2010 adults consumed on average 11.3 per cent of their total daily calories from fast food. That’s down from 12.8 per cent between 2003 and 2006. What’s more, the number of calories people got from fast food didn’t differ markedly between men (11.8 per cent) and women (10.9 per cent). NHANES is a program of studies that regularly assesses the health and nutritional status of adults and children in the United States. Younger adults, ages 20 to 39, are the biggest fast-food consumers, according to the new NHANES findings. Within that demographic, non-Hispanic whites and Hispanics got about 14.5 per cent and non-Hispanic blacks 21 per cent — more than one-fifth — of their daily caloric intake from fast food. As people get older the amount of fast food they eat starts to drop. The NHANES researchers found that among people ages 40 to 59, 10 to 13 per cent of daily calories came from fast food. Among people 60 and over, fast food accounted for just 6 per cent of their total daily calories. People who weigh the most eat more fast food, regardless of age. Overall, the latest NHANES report found that people who were underweight or of normal weight took in 9.6 per cent of their daily calories from fast food, compared with 11 per cent of overweight individuals and 13 per cent of people who were obese. That’s not surprising. Research published in the journal Obesity in 2009 found that lunches purchased at fast-food restaurants in New York City averaged a hefty 827 calories each. Overall, one-third of the lunches exceeded 1,000 calories; the highest-calorie meals came from hamburger chains (39 per cent) and chicken chains (48 per cent). Eating a diet that’s heavy on fast food poses health risks. Research published in the journal Circulation in 2012 found that Chinese adults who ate American-style fast food twice a week were 56 per cent more likely to die of heart disease and 27 per cent more likely to develop diabetes than people who did not eat fast food. People who downed fast food four or more times a week increased their risk of dying from coronary heart disease by nearly 80 per cent. Another study published in The Lancet in 2005 reported that people who visited fast-food establishments more than twice a week gained an extra 4.5 kg of weight — nearly 10 pounds — over 15 years and had a twofold greater increase in insulin resistance compared with people who frequented fast-food restaurants less than once a week. Both the weight gain and increased insulin resistance raised people’s risk for obesity and Type 2 diabetes. The fewer fast foods people eat, the better. “Since these foods are high in fat, saturated fat and added sugar it would be wise to limit their intake in order to meet the U.S. Dietary Guidelines for Americans, 2010,” says study co-author R. Bethene Ervin, Ph.D., R.D., a nutritional epidemiologist at the NCHS. The new report was published today (Feb. 21) by the National centre for Health Statistics. Pass it on: People are eating fewer fast foods but there’s room for improvement.